Have you been living for a while in the Spanish territory? Would you like to live in Spain for a longer period of time? In that case, you will need to apply for the Spanish citizenship, which will allow you to live legally in the country for the long-run. But which are its main benefits? And how to get it? In this post, we will explain how to obtain the Spanish citizenship, step by step. Prepare your pen and paper! SPANISH CITIZENSHIP OR PERMANENT RESIDENCY? If you have been living in Spain for several years and would like to stay in the long run, the question regarding which is your best option will surely pop out. What should I do, apply for the permanent residency or become a Spanish citizen, thus obtaining the Spanish nationality? Well, the reality is that both options will grant you the possibility to live in Spain indefinitely. Nevertheless, there are a few differences in regards these two possible paths, and clearly understanding them will be key. If you have lived in Spain during 5 uninterrupted years, you can apply for the permanent residency in Spain. This kind of permit grants to non-Eu citizens the possibility to stay in Spain over the long run. The conditions under which you will be living in the country are the same as those of the Spanish citizenship; therefore it can be your prefered option, as it is perhaps the easiest one. What is then the difference with the Spanish nationality? After 10 years living in Spain, you can obtain the Spanish nationality, thus becoming a Spanish citizen. The main downside of using this path in order to obtain the long run residency is that you will need to renounce to your original nationality, in order to get the Spanish one. There is, nevertheless, an exception to that rule. If you are from Andorra, Portugal, Equatorial Guinea, the Philippines or from a Latin American country, you can obtain your dual nationality; therefore there won’t be any need to give up your original citizenship. But the Spanish nationality has some positive aspects that the permanent residency does not. Which are those upsides? 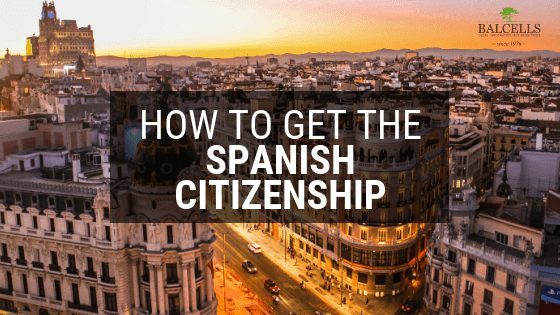 If you apply for the Spanish citizenship, you will have a much easier time navigating the Spanish bureaucracy whenever you need to start any legal process. Expats living in Spain for the long run may like to have the option to vote. Becoming a Spanish citizen, you will have the right to enter 183 countries with your visa on hand during the arrival. You will also be granted the right to live and work anywhere you want inside the European Union. Spanish is not planning to leave the EU any time soon. Therefore, these benefits are not going to change either expire during the upcoming years. HOW CAN I OBTAIN THE SPANISH NATIONALITY? Now that you know which are the main benefits of the Spanish citizenship and how that differs with the permanent residency, you may be asking yourself how to actually get the nationality and which are the exact steps that arise with the application process. There are three main ways in which you can obtain the Spanish nationality: by having lived enough years in the Spanish country, by birth, and by being a Sephardic Jew. 2 years if you are a citizen coming from a Latin American country, from Andorra, Philippines, or Portugal. In those cases, as we have already mentioned, you won’t need to give up your former and original nationality, and you will get the dual citizenship. Just 1 year for those married to a Spanish national or children/grandchildren of Spanish citizens born in Spain. If you are going to apply for this kind of residency as a family member of a European Union citizen through the civil partnership, do not hesitate to contact us to speed the process up. There is a special law for citizens with Jewish origin with ties to the Sephardic community that grants the Spanish citizenship for them, and without the need to stay in the country for any given period. That means that if you are a descendant of those expelled from the Spanish country in the 15th century, you can have the Spanish nationality, and without the need to renounce to your original citizenship. If you are a Sephardic jew willing to apply for the Spanish citizenship, you must hurry up, as the law was extended just until October of this 2019. Contact us if you need help determining if you are actually a Sephardic Jew and would like to get the whole process managed for you. And, how to apply for the Spanish nationality? Once you fill out all the required documents, you will need to submit them online. The application process will be processed, and you will receive the acceptance or denial in a 2-3 year period. Once approved, you will need to take an oath to the King of Spain and the constitution, and then your passport (actual document) will be sent. If you feel this is too much information and would like to have your life simplified, you don’t need to worry, our team of specialized immigration lawyers in Spain is here to help you out. We can manage the whole application process for you: determining which is the best path for you to follow, asking you the concrete documentation and information you will need to get your application approved, plus filling out and sending everything ourselves. You will just need to sign! What are you waiting for in order to get your Spanish Nationality? We can help you! Just send us an email at info@balcellsgroup.com and we will define the required steps you should take in order to apply. One of the requirements to get Spanish citizenship, if you are from a non-Spanish speaking country, is to take an exam, yes. If you have any other doubt, being related to the process or to the requirements, do not hesitate to contact our lawyers via email at info@balcellsgroup.com, we will be glad to help! As your case is a bit more concrete, we would really appreciate if you could send us an email to info@balcellsgroup.com so a specialized lawyer can analyze your case carefully and determine how to get the dual citizenship in that situation. добрый день, я и два ребёнка 2 и 4 года граждане Беларуси, моя жена гражданка украины, мы хотим выехать в испанию с дальнейшим проживанием там по карте резидента без права на работу, знаем что на нашу семью нам надо будет положить 46 тыс евро в испанский банк. работа у нас удалённая связанная с ютубом, но официальной работы нету, можно ли как то получить карту резидента? Good day, I and two children of 2 and 4 years old are citizens of Belarus, my wife is a citizen of Ukraine, we want to go to Spain with a further stay of a bank there. Our work is remote, associated with YouTube, but there is no official work, is it possible to get a resident card like that? I would really suggest you send us an email to info@balcellsgroup.com so we can analyse your situation in more depth and find a solution for you and your family. At our offices we also have the Honorary Consulate of Belarus, therefore we can be of even more help to you. Thanks for reaching out to us, we will be waiting for your email. How long have you been living in Spain with the permanent residency? Because getting the Spanish Citizenship depends on that. That depends on where you are actually residing. If you are from a Spanish-speaking country, you don’t have to take any exam. But, if the opposite is true, then you have to. We would really like to help you get Spanish Citizenship and manage the whole procedure for you. Would you like sending us an email at info@balcellsgroup.com so we can start as soon as possible? when you make the pledge or at any stage of citizenship, do they actually physically take your uk passport off you? are they allowed to ? I know it has happened but not sure if they actually can ? No, they only take it when they finally approve the Spanish citizenship (not during the application process) and you obtain the Spanish passport. Hope we have solved your doubts! I live and work in England but my daughter lives in Spain with her Spanish mother so she is half Spanish by birth. Can I apply for nationality via my daughter? or ask us anything at info@balcellsgroup.com if you still have any doubt. Have a nice day Dave! My name is Miguel Ferreiro I am 17 years old and live in South Africa and have a South African passport. My father was born in Spain but sadly passed away. I would like to get a Spanish passport if I can,and how? First of all, thank you very much for reaching out to us Miguel. As you are eligible for the Spanish Citizenship, we would really appreciate if you could send us an email at info@balcellsgroup.com so we can help you out with the whole process.